Beholder 2 for is a sequel to the well-received 2016's adventure game developed by Warm Lamp Games. Both games were published by Alawar Entertainment. 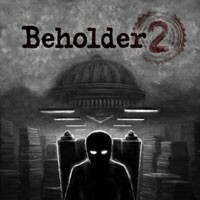 In Beholder 2, players once again are taken to a dystopian country, whose citizens are forced to live in accordance with the rules created by the authoritarian government. The main protagonist is a man working at the ministry. The actions of the players determine whether they do their job diligently or decide to undermine their co-workers' positions only to reach their goal. The story is nonlinear and depends on ambiguous moral decisions the players are bound to make. Beholder 2 does not introduce any revolutionary changes to the gameplay mechanics. Players can still observe the action from the side perspective. Their main objective is to observe their coworkers, eavesdrop on them, and (when they are gone), go through their stuff to find some damning pieces of evidence. It is up to the player to decide how to use the acquired pieces of information. One can blackmail his or her victim or act instantly by delivering a denunciating letter with all the evidence attached. Next, the player can sit back and observe the consequences of his or her actions, which often end tragically for the accused person. On the other hand, one can keep these pieces of evidence to himself or even help the coworker in question. One should be careful, however, as if the supervisors find out about such thing, the player will not be promoted (moved to a higher floor) and even punished for insubordination. Beholder 2 features 2.5D visuals – even though most of the elements are in 2D, others are in 3D. The game features cartoonish, yet grim style with an atmospheric soundtrack that well complements the life in a totalitarian country. Game score 9.2 / 10 calculated out of 81 players' votes. Expectations before the premiere: 9.4 / 10 calculated out of 39 players' votes.